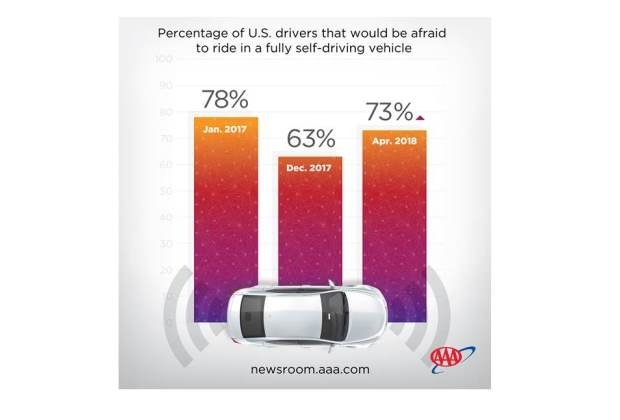 Following high-profile incidents involving autonomous vehicle technologies, a new report from AAA’s multi-year tracking study indicates that consumer trust in these vehicles has quickly eroded. Today, three-quarters (73 percent) of American drivers report they would be too afraid to ride in a fully self-driving vehicle, up significantly from 63 percent in late 2017. Additionally, two-thirds (63 percent) of U.S. adults report they would actually feel less safe sharing the road with a self-driving vehicle while walking or riding a bicycle. To help educate consumers on the effectiveness of emerging vehicle technologies, AAA and the Automobile Club of Southern California are committed to the ongoing, unbiased testing of automated vehicle technologies. Previous testing of automatic emergency braking, adaptive cruise control, self-parking technology and lane keeping systems by the Auto Club’s Automotive Research Center has shown both great promise and great variation. Future AAA testing will look at how well systems work together to achieve higher levels of automation. Drivers can request roadside assistance, identify nearby gas prices, locate discounts, book a hotel or map a route via the AAA Mobile app. To join, visit AAA.com.